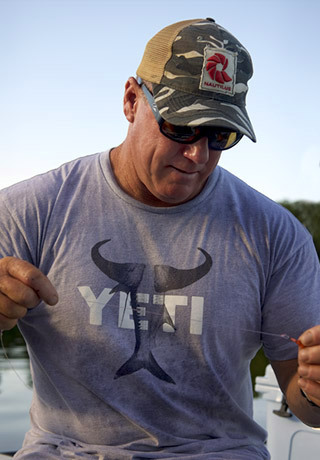 Rob built his fishing skills like so many others — in the Florida Keys. But Rob differentiated himself from an early age, netting the MET (Miami Metropolitan Fishing Tournament) Master Angler award while he was still in high school. Rob’s guiding career currently has him working with anglers for both in- and off-shore fishing, spending roughly 300 days out of the year on the water. But it’s when you get Rob talking that his love for tarpon becomes clear. That thrill of tarpon fishing has been captured on Rob’s shows such as “Silver Kings”, and most recently "The Seahunter" airing on The Outdoor Channel. He is the only guide to have won all four major Fly Tarpon Tournaments in the span of their 50 year history. What gear do I need for today's adventure. To not take it so personal when I don't win a tournament I'm competing in. The men and women who have fought for our country and the freedom we embrace here. Spending 280-plus days a year on the water takes a real toll on your body, but I can't imagine doing anything else. The sounds you hear of nature waking up just before sunrise. If I could pass the training,a Navy SEAL or Marine sniper.